Live on Facebook: NIH Director Dr. Francis Collins on earth and NASA astronaut Dr. Kate Rubins in space. NIH went a bit intergalactic on October 18 when, from aboard the International Space Station (ISS), flight engineer and biologist Dr. Kate Rubins of NASA discussed research aboard the orbital laboratory—particularly the DNA sequencing experiments—during an in-flight conversation with NIH Director Dr. Francis Collins. The National Library of Medicine was glad to help contribute to its success. NIH could set up the live stream with NASA but they didn’t have the ability to view the live broadcast of what was being shown on NASA Channel 346. That’s where NLM helped. “Although we had never planned for or sent one of our internal cable feeds outside of building 38 or building 38A [NLM buildings], we were fairly confident we could resolve their dilemma,” said Travis Burgdolf, Leidos program manager for NLM’s professional engineering services contract. 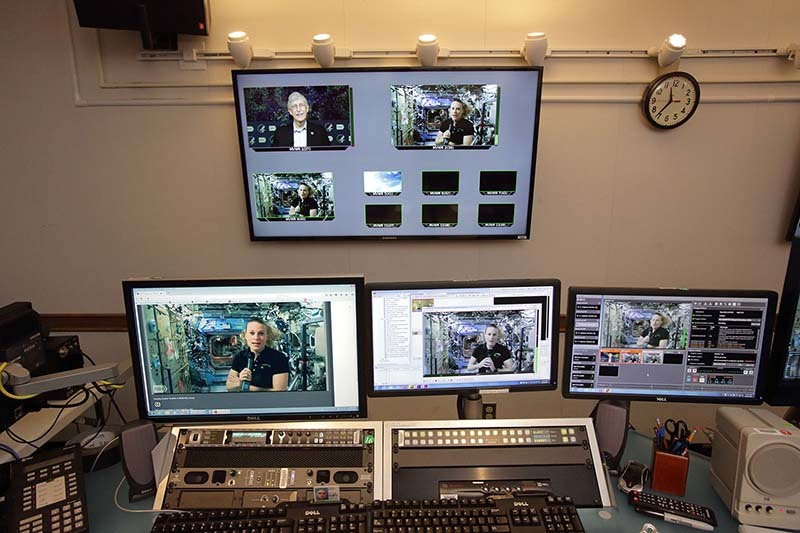 Burgdolf and his team of audiovisual engineers reconfigured an NLM DirectTV channel to the NASA Channel 346 by identifying a route for the signal and engineering signal conversations. This made it possible for NLM to provide live television back to NIH’s building 10, where NIH Director Dr. Francis Collins was for the SpaceChat. NLM helped make it possible for everyone on the ground at NIH to see what viewers at home had on their screens. “We’re glad we could facilitate the delivery of the video feed to building 10 so the NIH production team could see what everyone at home could see at the same time,” said Anne Altemus, acting chief of the Lister Hill National Center for Biomedical Communications’ Audiovisual Program Development Branch, which provides service support for and coordinates the use of NLM audiovisual facilities. Astronaut Rubins has the distinction of performing the first successful DNA sequencing in microgravity as part of the Biomolecule Sequencer, in August, aboard the ISS. The ability to sequence the DNA of living organisms in space opens a new world of scientific and medical possibilities. The October chat between Rubins (on the ISS) and Collins (on NIH’s Bethesda, Maryland campus) was live streamed on NASA TV, Facebook Live, and Ustream, and can now be viewed on NIH’s YouTube channel. Conversations between Astronaut Rubins and Dr. Collins typify the NLM Lister Hill Center’s philosophy of identifying a communications need in the health sciences, applying the most modern technology to a solution, and developing a prototype system to demonstrate its feasibility to the medical community—wherever they are. Even outer space. December 14, 2016 in Events.